Soheil Feizi, Daniel Marbach, Muriel Médard & Manolis Kellis, Network deconvolution as a general method to distinguish direct dependencies in networks, Nature Biotechnology 31(8), 2013, p 726–733. Figure 2 from Feizi et al. aligned to Figure 2 from Marbach et al. The x coordinate in the ROC is the false positive rate. If one doesn’t make any predictions of edges at all, then the false positive rate is 0 (in the notation above k=0, t=0). On the other hand, if all edges are considered to be “true”, then the false positive rate is 1 and the corresponding point on the ROC is (1,1), which corresponds to k=n, t=m. If a method has no predictive power, i.e. the ranking of the edges tells you nothing about which edges really are true, then the ROC is the line y=x. This is because lack of predictive power means that truncating the list at any k, results in the same proportion of true positives above and below the kth edge. And a simple calculation shows that this will correspond to the point ( ) on the ROC curve. ROC curves can be summarized by a single number that has meaning: the area under the ROC (AUROC). The observation above means that a method without any predictive power will have an AUROC of 1/2. Similarly, a “perfect” method, where he true edges are all ranked at the top will have an AUROC of 1. 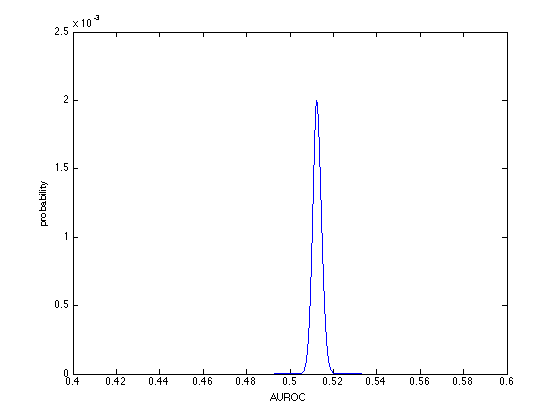 AUROC is widely used to summarize the content of a ROC curve because it has an intuitive meaning: the AUROC is the probability that if a positive and a negative edge are each picked at random from the list of edges, the positive will rank higher than the negative. The ROC and a PR curves before (top) and after (bottom) applying network deconvolution to the GENIE3 network. Distribution of AUROC for random methods generated from the S. cerevisiae submissions in Marbach et al. In other words, almost all random methods had an AUROC of around 0.51, so any slight deviation from that was magnified in the computation of p-value, and then by taking the (negative) logarithm of that number a very high “score” was produced. The scores were then taken to be the average of the AUROC and AUPR scores. I can understand why Feizi et al. might be curious whether the difference between a method’s performance (before and after network deconvolution) is significantly different from random, but to replace magnitude of effect with statistical significance in this setting, with such small effect sizes, is to completely mask the fact that the methods are hardly distinguishable from random in the first place. To make concrete the implication of reporting the statistical significance instead of effect size, I examined the “significant” improvement of network deconvolution on the S. cerevisae and other datasets when run with the protein parameters rather than the default (second figure above). Below I show the AUROC and AUPR plots for the dataset. The Feizi et al. results before and after network deconvolution using alpha=1, beta=0.99 (shown with AUROC). The Feizi et al. 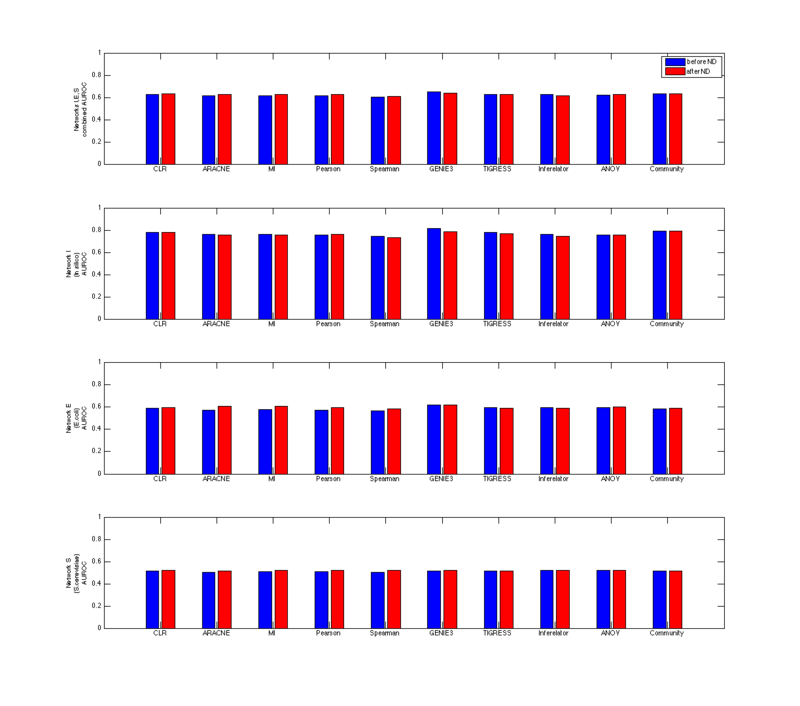 results before and after network deconvolution using alpha=1, beta=0.99 (shown with AUPR). D. Marbach et al., Wisdom of Crowds for Robust Gene Network Inference, Nature Methods 9 (2012), 796–804. 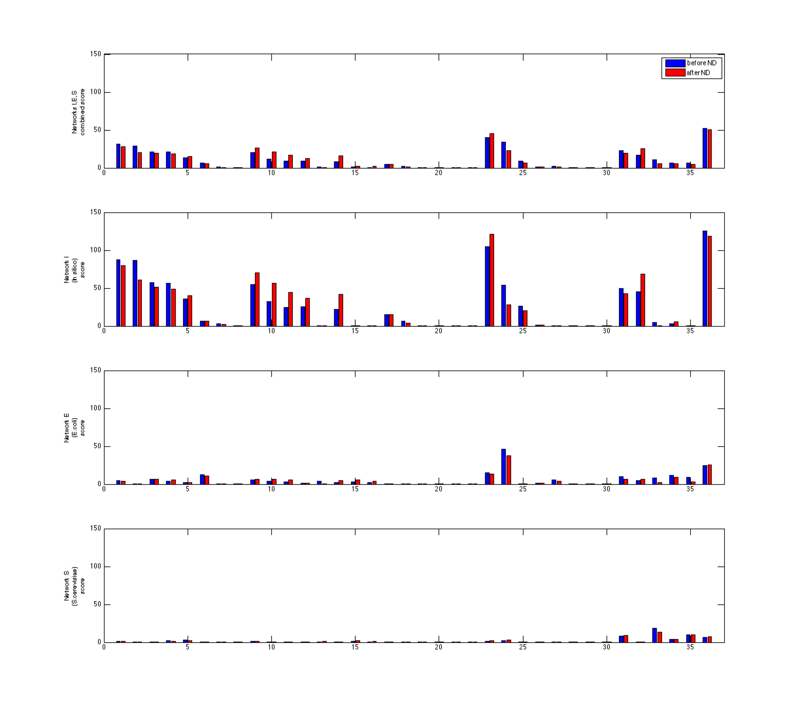 The DREAM5 results before and after network deconvolution. Alas, network deconvolution decreases the quality of the best method, namely the community method. The wise crowds have been dumbed down. In fact, 19/36 methods become worse, 4 stay the same, and only 13 improve. 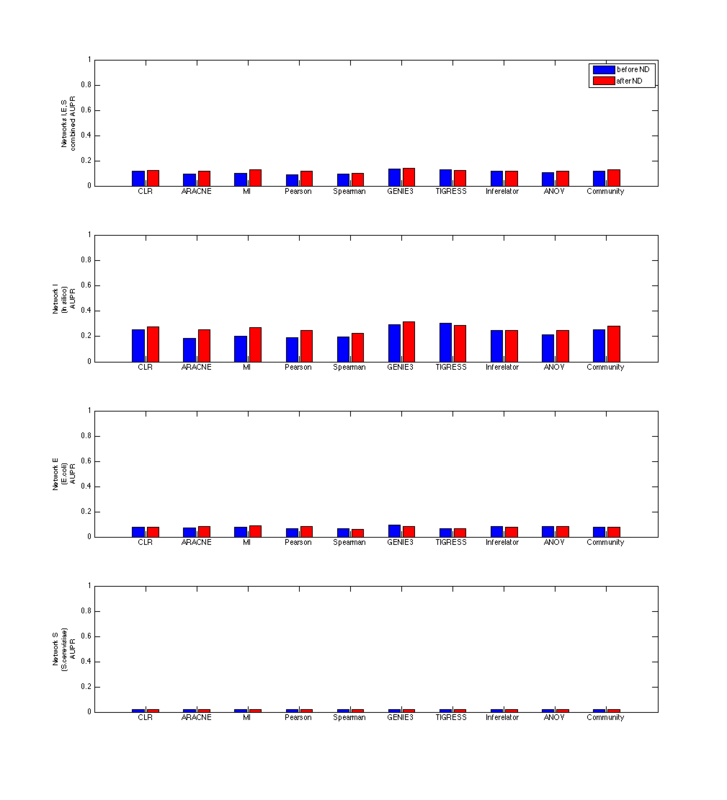 Moreover, network deconvolution decreases the quality of the top method in each dataset. The only methods with consistent improvements when network deconvolution is applied are the mutual information and correlation methods, poor performers overall, that Feizi et al. ended up focusing on. I will acknowledge that one complaint (of the many possible) about my plot is that the overall results are dominated by the in silico dataset. True- and I’ve tried to emphasize that by setting the y-axis to be the same in each dataset (unlike Feizi et al.) 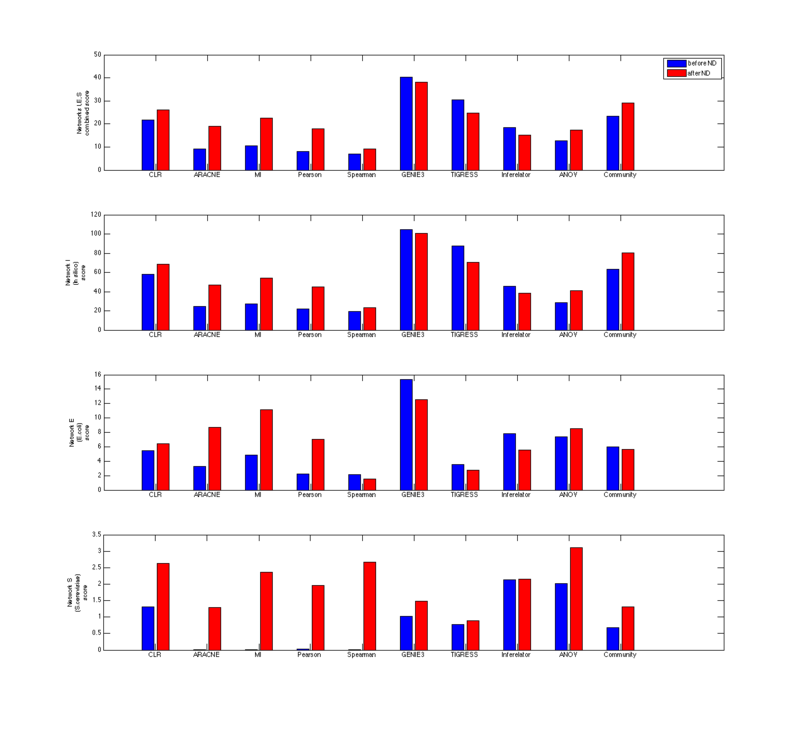 But I think its clear that no matter how the datasets are combined into an overall score, the result is that network deconvolution is not consistently improving methods. All of the analyses I’ve done were made possible thanks to the improved usability of network deconvolution. It is unfortunate that the result of the analyses is that network deconvolution should not be used. Still, I think this examples makes a good case for the fact that reproducibility is essential, but usability is more important. Reblogged this on Jonathan Eisen's Lab. > There is one problem with AUPR, which is that its value is dependent on the number of positive examples in the dataset. For this reason, it doesn’t make sense to average AUPR across datasets (while it does make sense for AUROC). For all of these reasons, I’m slightly uncomfortable with AUPR but that is not the main issue in the DREAM5 analysis. This is not quite true: AUPR can be compared between datasets, but only if the ratio of true:false examples is equal. Agreeably, this is a huge limitation, but the stated generalization [that cross-dataset PR results are incomparable] can probably be seen as either generally true (i.e., independent of the measure) as a problem inherent to the different nature of any dataset, or it has to be hedged on the above condition. Additionally, the ROC has the huge shortcoming that it performs very poorly on highly unbalanced sets – such as the DREAM interaction challenges, where most of all possible interactions are wrong. 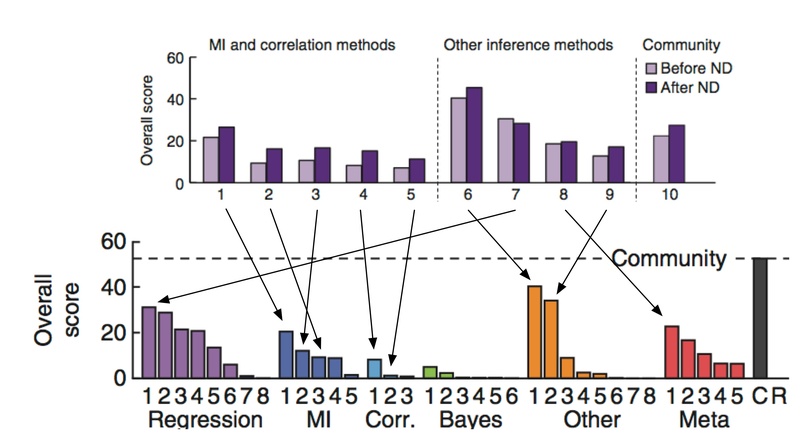 This issue can be compared to the problem of using Accuracy vs. F_1-Measure when evaluating classification performance, where the former produces very “optimistic” results on imbalanced sets, too, and should not be used in those cases (instead, MCC would be the right choice in those cases – see below). This has been shown by Davis & Goadrich, The Relationship Betweeen Precision-Recall and ROC Curves, ICML 2006, where they demonstrated that a curve that dominates in PR space is guaranteed to dominate in ROC space, but not vice versa. The only fair, uniquely comparable score I know of – but that does not take ranking into account – is MCC (Matthew’s Correlation Coefficient) used, e.g., in the CASP challenges. All this implies that using AUROC is not a very good choice to make comparisons between DREAM challenge results/teams and explains why the DREAM organizers report AUPR (and not AUROC) [in Marbach’s Nat Methods paper], while [Feizi el al.’ Nat Methods paper] choice of using AUROC seems questionable to me, particularly given the above proof by Davis & Goadrich. However, overall, and in defense of ND, I think the focus of this new method should not have been to try to demonstrate that ND is superior to existing methods. Rather, its true beauty is the fact that it can be implemented as a computationally inexpensive operation, and presumably much less expensive than any existing method. Although, by now, I am not sure what the computational cost of calculating the initial normalization needed for the Taylor series constraint is, so it would be interesting to learn if there are any [exponential?] computational costs in the initial normalization that has been looked into by these blog series. So unless there is an issue, in this sense at least, their approach might indeed fulfill “usability” when compared to existing methods. Regarding ND, I think you misunderstand the idea. It requires first running another method, and then applying ND to the output of that method. Therefore by definition, it cannot be more efficient than any existing method. The point about AUPR, that cross-dataset comparison requires the true:false ratio be the same, is exactly what I claimed. So I think we agree on that. 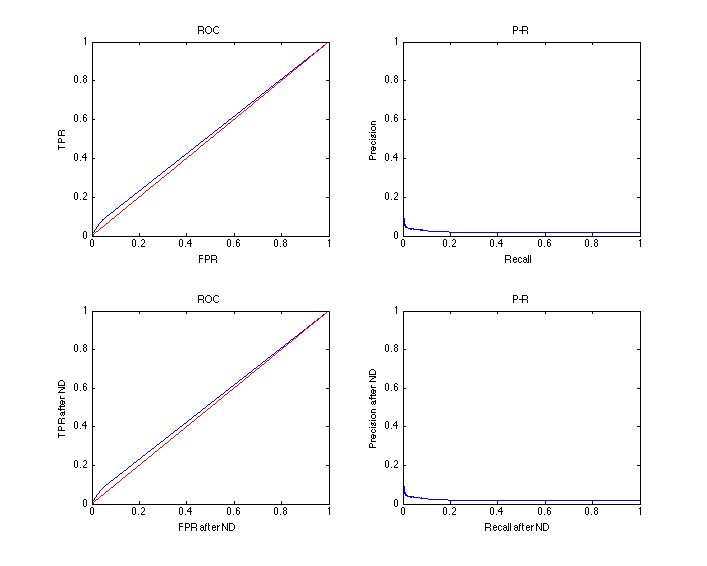 I also agree that ROC and PR are not independent, which is why I can’t really provide an explanation of why it makes sense to average them, let alone average the p-values computed as in DREAM5 or by Feizi et al. In any case, the Feizi et al. results are terrible, in absolute terms, regardless of whether one looks at AUROC or AUPR (I show both in my post). A final point of correction: Marbach et al. do report AUPR but the ranking of methods is based on the weird averaging I just mentioned and that is explained in my post. So it is not true that they are using AUPR. By computational less expensive, I was referring to Big O notation; So it does not matter if you have to run one method and then another. The only question is which of those methods behaves linearly [O(n)], log-linearly [O(n*log n)], polynomial [O(n^c)], or exponential [O(c^n)]; From a computational aspect, chaining two linear operations is much cheaper (for n>2, at least) than, say, even just one quadratic operation, and for a reasonably sized n, this holds even for chaining two approaches with log-linear behavior. For example, an cubic operation is implied when you have a matrix factorization like N N^-1 in the method (and can’t work around it). Gustavo, yes, you are absolutely right! Sorry for my poor writing, I’ve probably confused a few readers by only mentioning a single “curve” rather than referring to the ordering of two different results that only holds when going from PR space to ROC space, but not vice versa. Thank you for pointing out this clarification. Lior, I am curious on how you are setting the threshold on usability as defined in this and previous posts. That is, when does code or results become usable or not usable. When reading through your posts it appears to mean that the definition of usability relates to you (or anyone else) being able to take code or results and apply them for some other purpose, but it seems to be limited to continued development of computational methods. I think usability of code is bit easier to define than usability of results. What stood out to me was the calling of the predictions from the DREAM5 paper not usable. From a biological perspective, I would say these results are very usable and directly actionable and this was shown in the paper through follow up validation experiments in Ecoli. I would have a hard time seeing any molecular biologist willing to invest time in testing the 100,001, 100,002, and 100,003 ranked predictions in the list. I think the distinction between repeatable and usable is quite important, but I also think the definition of usable can be different for different researchers and would be interested in your thoughts. Maybe another post on this topic?? That is a good question. I was indeed thinking of computational methods development, but I think usability also applies to biological discovery. In the case of DREAM5, while its true that the 100,001th prediction may not be of interest to test, availability of the methods code would be very helpful. For example, it would allow a biologist to use the method on a different dataset (DREAM5 did not distribute this). Moreover, the full matrices are useful as well. In choosing a method for themselves, a biologist may wish to apply an evaluation criterion that requires all the entries, and not only the top ones. So I think that distribution of the complete predictions and the code of the methods would have indeed constituted usability in this case. I would add that I’m not sure the results were demonstrated to be “useable” by virtue of the experimental validation. The E. coli test did show good results but its unclear to me on what basis the transcription factors were chosen. This “score” seems like a rather odd metric to use. Another drawback of precision is what one does when no predictions were made, i.e. true positives + false positives = 0? Presumably this situation can be avoided by merely starting at the highest scoring prediction, but in cases where methods are outputting scores that can be interpreted as probabilities (in the range of 0 to 1) one may want to ask “at a particular threshold, how does method A compare to method B”. These are not situations one encounters when using sensitivity and specificity (dividing by zero), although I agree with the comments regarding AUC on unbalanced data-sets. Building on Curious observer’s remarks, I wonder what would constitute a “usable” contribution for a mostly “wet” paper ? An incredibly detailed protocol? One worry about setting that as the threshold would be that protocols are often heavily optimized towards a particular application, meaning that it wouldn’t fit the bill for new or novel applications. Any thoughts? One meaning for usability in the context of biological results is a physical reagent produced during the investigation and shared with the community. Transgenic mice and cell lines are often used by many investigators for experiments quite unrelated to their original purpose. I had never thought that a knockout mouse and an R library had much in common, but from this point of view they might. Just landed here … I think that M. Kellis and his students should, perhaps, consider taking legal actions against this bully (Lior Pachter) and his mouthpiece (Bray with his continual echoes), who, in the frankly false pretense of defending the integrity of science, continue to defame their targets and issue ad hominem attacks. If indeed the purpose is to conduct post peer review effectively, this bully has done more damage to the process than he can perhaps appreciate (driven apparently by the rejections they have received from the various journals), as his innuendos frankly distract from the critical work of understanding the real issues. Tenured academics who get away with this type of nonsense, in the name of scholarship, end up giving scholarship a bad name, IMO. How one communicates one’s claims has everything to do with one’s scholarship and cannot be separated from it. (Why not pursue publishing in a peer reviewed venue? And why not try other journals, like the rest of us who may be sent away by these high-impact journals?) Finally, this reflects more on the bully and his mouthpiece than on their targets. A) The very serious accusation of fraud is off the table. This, I think, should be a relief for the whole community. B) While the metric used in the DREAM5 case may not be the best, one cannot fault Feizi et al for using the same metric as was used in DREAM5. C) ND is not robust to parameter choice (there may be some heuristics how to set \alpha or \beta, but it’s not clear they would be general). D) ND doesn’t really perform any better than methods designed for a particular problem (that was already clear in the protein structure case, and it’s cleared up more for the DREAM5 case here). Just a brief reminder of (just some of) what we’re talking about here: they took the name “transitive closure” – truly a foundational operation on networks – and applied it to a different operation than that term has ever applied to. They then claimed to be inverting this new “transitive closure” when in fact they weren’t. Subsequently, they went around crowing about how they had thereby introduced a new foundational operation on networks. If computational biology is a place where it’s acceptable behaviour to deceive other people about the significance and meaning of your work, then, sure, people should take relief in the fact that Soheil Feizi, Daniel Marbach, Muriel Médard, and Manolis Kellis have (possibly) lived up to the depressingly low standards of our field. Perhaps other computational biologists look at this situation and think, to quote your earlier comment, “Thus, they managed to ‘get a major paper’, rather than publishing this in a technical journal (where it probably belongs). Good for them.” But the fact that no one who is not directly associated with the authors has stepped forward (publicly or privately) to defend this paper at least makes me hope that few actually think that way. Whatever the case, should we not expect computational biology to be more than a game in which people try to figure out how best to deceive reviewers and readers in a quest for “major papers” and grant money? The statement in the first post that had me (and many others) the most worried was “Despite our best attempts … we have been unable to replicate the results of the paper”. You guys being highly competent people, the most parsimonious explanation for this appeared to be that the authors may have resorted to some sort of actual fraud (outright forgery by your definition). This would have been very shocking indeed! So, I and the whole community are relieved that this is off the table. I’m curious as to whether or not the current version of the code on the Supplementary website matches more closely with the description of the method in either the main text or the Supplementary methods? I unfortunately did not download the earlier version of their script. July 2013: The original version distributed with the paper consisted of a single program, ND.m. It contained two parameters, called “delta” and “alpha”. Delta corresponded to what was “Beta” in the supplement. “Alpha” was never mentioned in the supplement (there is an alpha in the supplement but it refers to something other than this parameter). Beta was also not mentioned in the main text, except, as I have explained in the original blog post on ND, in passing in a single sentence where it was made to seem irrelevant. The default for delta (beta) was 1, which was a value inconsistent with the premise of the paper, namely that beta should always be strictly less than 1. The default value for alpha was 1. Although not described in the supplement, it turned out that the parameter values used for the three datasets were (delta,alpha) = (0.5,0.1), (0.99,1) and (0.95,1). The code could be used for the protein and coauthorship networks, but did not match the required steps for the DREAM analysis, and in fact we were unable to get it to work despite repeated attempts and a number of requests for help to the authors. Finally, an initial affine transformation of the input matrix mapping it to values between 0 and 1 was implemented in the code but not described anywhere in the supplement; neither was there in the supplement a mention of the fact that diagonal entries were set to zero (which was in the code). In other words, in terms of the original post I made on the paper where I described 7 steps in the code, only steps 4,5,6 were described in the supplement. August 2013: After we contacted the authors asking why delta (beta) was set to 1 when that made no sense in terms of the paper, they released a new version of the code on the NBT website with delta (beta) now set to 0.9. This is still the version that one gets from the NBT supplementary website. It was one of the reasons we became suspicious of the paper, because in the supplement it had said that beta should be set as close as possible to 1, yet now the fix for the incorrect beta=1 was to set it to 0.9. February 2013: After my blog post came out, the authors created a new companion website for the paper where they posted a new version of the code. The code is now in the form of two different program: “ND code for symmetric networks” and “ND code for regulatory networks”. The latter is the code to be used for the DREAM analysis, and the former for the protein and coauthorship network analysis. The symmetric ND.m has default values alpha = 1 (matching what is now disclosed in the updated supplement as the parameter for the protein and coauthorship network) and beta = 0.99 (matching the parameter used for the protein network, but not the coauthorship network). Beta is now called by its correct name, but its still the case that alpha is not mentioned in the supplement (nor does it correspond to the alpha that is mentioned there). I should note that the authors have been fiddling with the software on the website without including release notes, including changing of the default beta once or twice, but I have not been tracking the code day-by-day (as an aside, they have been insisting over and over that the method is robust to the choice of parameters, yet they have been changing the parameters constantly, and used different ones for the different datasets, why?). In addition, the affine mapping step is commented out of the code, i.e. it has been removed, but instead has been inserted into the scripts distributed for replicating results. I guess this is so the authors can call it a “pre-processing step”. It is still not described in (even the updated) supplement. The regulatory ND.m has default beta=0.5 and alpha=0.1, matching the parameters used for the DREAM analysis. This program also contains some new code for symmetrizing the input matrix and perturbing it if the result is not diagonalizable. These turn out to be required steps not mentioned in the original supplement. It should also be noted that in addition to code changes, the authors also released the complete data required to run ND for the first time in February 2013. I have to add a final comment, namely that the software is a very simple piece of code, because even though its not one line, the additional steps are straightforward. Leaving aside comments in the code, the whole thing is about 80 lines. In fact, Nicolas Bray re-implemented it in R back in August in a few minutes (the whole thing is, annoyingly, in MATLAB which requires a license). But my point is that I have never, in my entire career, seen anything like the sorts of things above happening, especially with such a simple piece of code. Splitting of the software into two pieces.. constant changes in the default parameters.. missing pieces added after the fact.. removal of parts.. the whole thing is highly irregular. i am new in the field but old in life(being 54 and all)..So to me it sounds like the money is too much!! :):)Really science today has gone wrong (and i know this is generalising but ,if it is true how can one describe it? ).The investors is the main target and not the science.And as for the paper in question ,i can only say from my experience that there are around lotrs of such scientists ,(pretend to be),who got through the system somehow and obtained a title,as a means to achieve riches and fame. And unfortunately,there are countless examples of these @scientists@ backing all kinds of claims that lead to some smart guy making profits without even having to leave home.Not to mention all these who advise ,and create laws based on their own false science. (remember the IMF paper that was the cause for implementing artificial poverty in greece and europe>>? ?peer review was nowhere to be seen ,but still these guys advised on global policies….So big up to you for uncovering few of these ….guys.